Positive: Compact size; good price; nice connectivity; decent hardware. Positive: Impressive design; light weight; compact size; excellent display; good hardware. 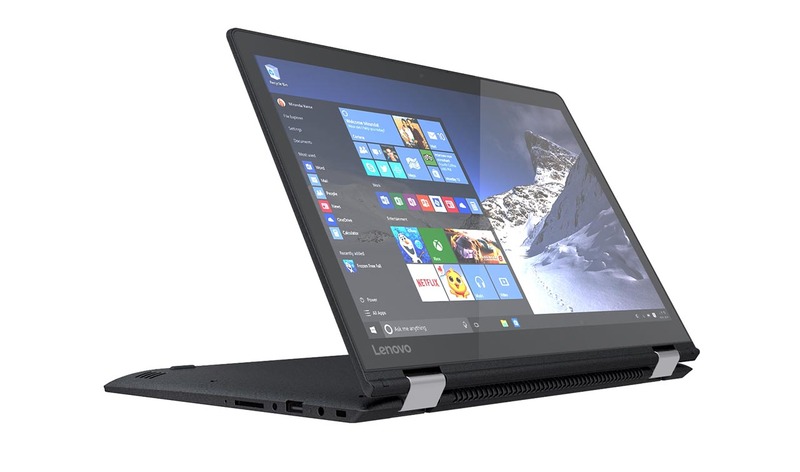 Negative: No USB-C.
Model: The Lenovo Yoga 520-14IKB-80X8006MSP is suitable if what a user is looking for is a lightweight, versatile and easy to carry a laptop. Its 4-in-1 convertible design is precisely designed to meet the demands of those who choose mobility and comfort above all else. With this laptop, users can perform tasks typical of a model of these characteristics, including the office work of the day, a quick navigation on the Internet, watch HD videos on YouTube and interact more comfortably with pre-installed applications under the tablet mode. This new model has an innovative 4-in-1 convertible construction thanks to a high-resistance 360º hinge, which allows it to act as a laptop, tablet, tent and multimedia screen whenever needed. The device only measures 33.6 x 23.2 x 2 cm and weighs just 1.75 kg (with 2-cell battery included). Hence it is light and handy when taking it to the office, institute or anywhere you go. At the multimedia level, it highlights the implementation of a 14-inch multi-touch panel that, although it does not have Full HD resolution, enjoys an optimal standard HD resolution of 1.366 x 768 pixels to watch movies and series in high definition. In addition the IPS technology offers better viewing angles. The display has a brightness level suitable for use in brightly lit rooms without major problems, but not for outdoor. As for hardware specifications, it features a low power Intel Core i5-7200U processor with up to 2.5 GHz, which allows to perform medium demanding tasks. It has 8 GB of DDR4 RAM at 2133 MHz and a 256 GB SSD, but no internal optical drive. However, the presence of an m.2 socket (compatible with NVME), and another SATA3 (2.5-inch) slot will allow users to place two storage units in this model, whether they are a hard disk and an SSD, or two SSDs. The Intel HD Graphics 620 allows playing multimedia content and gaming at low details. The integrated 2-cell lithium battery ensures a battery life of up to 6 hours under a very basic WiFi use. In addition, its fast-charging technology allows recharging the battery to 100% in just 3 hours, being 40% faster than conventional laptops. As far as sound is concerned, Harman Kardon's exclusive audio technology will guarantee improved acoustics and clearer and more enveloping sound when listening to music and watching videos through the dual stereo speakers integrated under the palm rest. For the rest, it has an HD webcam, a digital microphone and audio combo output for online video conferencing via Skype from anywhere.